Source: ARC courtesy of Goodreads First Reads and Penguin Canada. Thank you! After seeing the Drew Barrymore-directed Whip It– based on Shauna Cross‘s novel– I always thought the world of roller derby seemed so fantastic- larger-than-life, loud, and physically demanding! Through the eyes of Astrid- a twelve-year-old aspiring roller girl- Jamieson brings us the world of roller derby in a bright, compelling and visually appealing graphic novel. Astrid and her best friend Nicole are introduced to the world of roller derby by Astrid’s mom. The girls are expecting another trip to a museum or art gallery- something more serious and ‘educational’- so they are pretty shocked and delighted when they find themselves at a derby. Astrid is almost immediately hooked; she loves everything she sees about the sport, and is particularly inspired by with one amazingly cool female derby athlete named Rainbow Bite. Nicole, however, does not seem to be as enthused, and for Astrid, this comes as a shock. The two of them have done just about everything together and seem to have enjoyed most of the same things…so what does it mean for their friendship when their interests really start to diverge? What’s going to happen to their friendship once they start junior high? While trying to make something of herself as one the youngest and most inexperienced roller girls at derby camp, Astrid attempts to balance a number of personal issues. She tries to navigate her now very-unsteady friendship with Nicole, while keeping a few big secrets from her mom, and getting herself noticed- for the right reasons- at derby. I really like the way that Jamieson balances the rich details of the sport and competition, and the arcs of Astrid and Nicole’s friendship, and Astrid’s coming into her own. I personally wish, however, that the story had delved more into Astrid’s relationship with her mom- I was simply keen to know more about their bond and their family history as it seemed ripe for more attention. I also wish that Nicole’s new ballet friend Rachel- who pops up numerous times- could have been less typically one-note (i.e. general snooty mean girl) than she was portrayed. Those notes aside, though, this is a very solid read with a well thought out story and main character. Overall, I found Roller Girl to be an exuberant, intelligent and entertaining graphic novel. Jamieson’s delightful debut is, I think, a very welcome addition to the contemporary, coming-of-age, middle-grade graphic novel oeuvre; I can understand the comparisons to the work of best-selling graphic novelist Raina Telgemeier (who herself gave Roller Girl a high rating on Goodreads!). 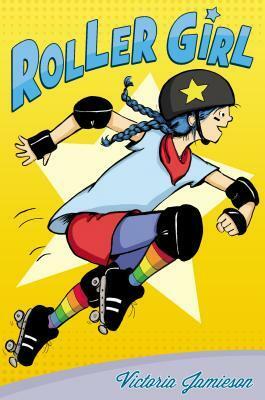 I would highly recommend Roller Girl for readers and fans of series like Big Nate, The Popularity Papers, Diary of a Wimpy Kid, or graphic novels such as The Dumbest Idea Ever!, El Deafo, Drama and Smile. Thank you to Goodreads First Reads and Penguin Canada.